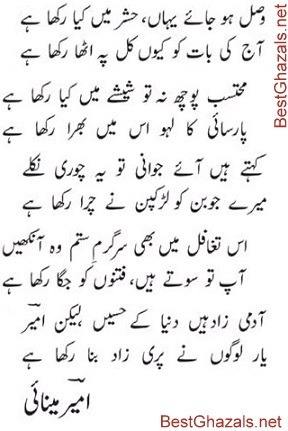 Amir Minai is one of the classical masters of Urdu poetry. A poet of Lucknow school of Poetry, he was the contemporary of Dagh Dehlvi. Amir Minai is known for his perfection on the ghazal genre. He passed away in 1900. The 'matlaa' or the first couplet of this ghazal is oft-quoted.